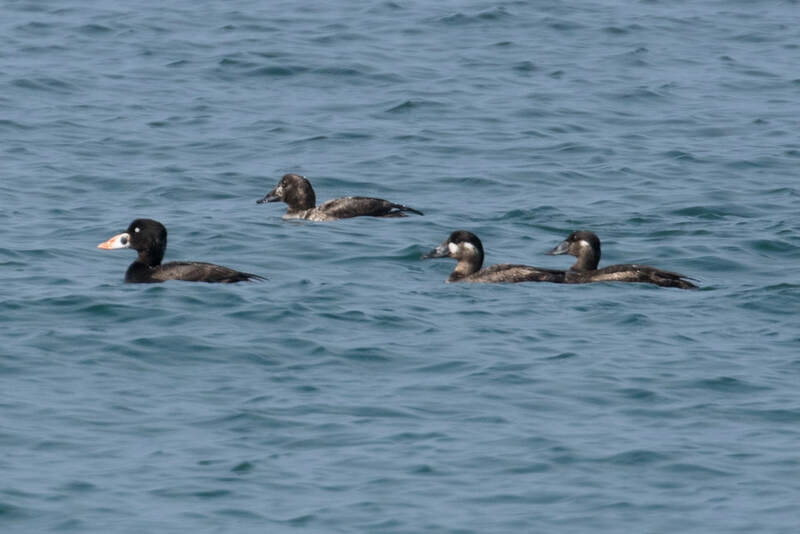 Top left: male surf scoter. Photo by Mike Yip. Top right: male and three females, photo by John Reynolds. Bottom: female (left) and males (right), photos by Josh Silberg. 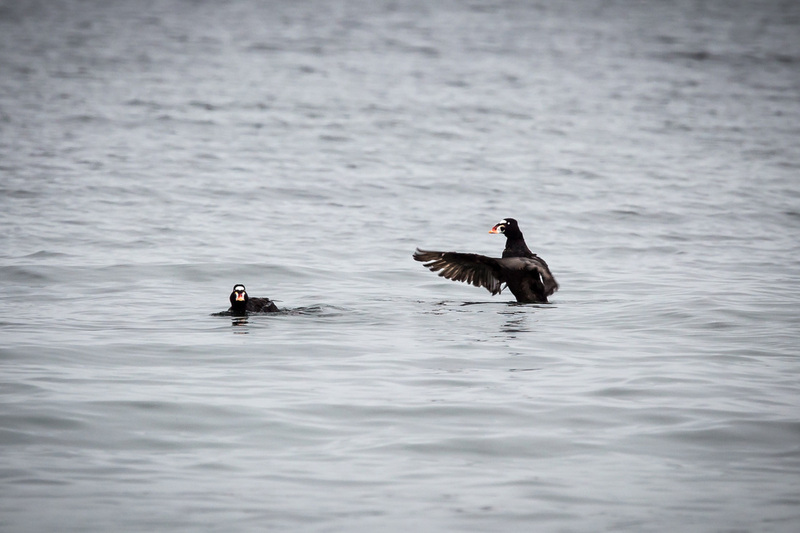 The surf scoter is a large diving seaduck. The male has a large, easily recognizable bill: white and orange with large black spot close to the base. Male plumage is all black except for white patches on the forehead and at the nape of the neck. The female is less boldly coloured, with dark brown to black plumage and two pairs of dull light-coloured patches on the face. It also has a white patch at the nape. 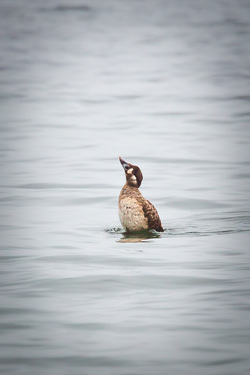 Juveniles are similar to females but with white bellies; males will develop the colourful bill by the first winter to set them apart from females. While this species does not vocalize often, its wings make a distinctive wing whistle - especially when large numbers of birds take off at the same time. The surf scoter winters on ocean waters off the east and west coasts of North America. It may be spotted around marinas and in bays and estuaries. Flocks of surf scoters may be seen on lakes in southern coastal and inland BC, parts of Alberta, and the northeastern United States while migrating northward. During the summer months it ranges across northern Canada and Alaska, as well as the Central Coast region. Summer breeding habitat is on lakes and slow rivers in semi-forested areas as well as open tundra. The white-winged scoter (Melanitta fusca) and black scoter (Melanitta americana) can look similar to the surf scoter, especially from afar. 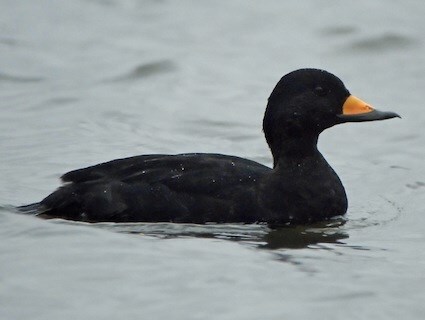 However, neither species has the multicoloured bill found on male surf scoters, and both male and female white-winged scoters have white wing patches, unlike the all-black or brown surf scoters. 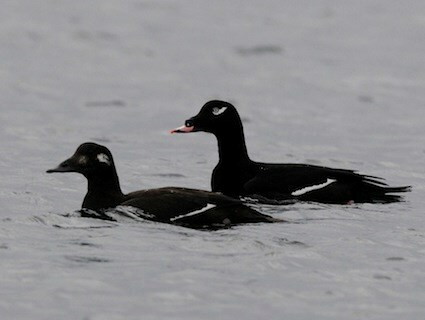 Male black scoters have yellow bills, and white-winged scoters have orange and black bills. The juveniles of all three species are quite similar. 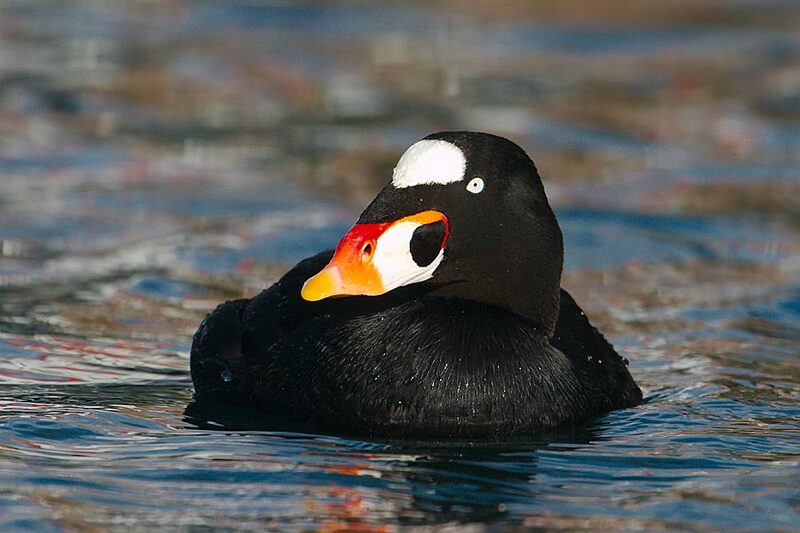 The surf scoter is a blue-listed species in British Columbia, meaning they are of special conservation concern as some part of their life history or distribution makes them vulnerable or sensitive to human impacts or natural events. Atlas of the Fauna of British Columbia. Lab for Advanced Spatial Analysis, Department of Geography, University of British Columbia, Vancouver. Accessed 03/3/2013. Surf Scoter Melanitta perspicillata. Audubon Birds. National Audubon Society. Accessed 25/03/2015. Surf Scoter Melanitta perspicillata. The Birds of North America Online (A. Poole, Ed.). Ithaca: Cornell Lab of Ornithology; Retrieved from the Birds of North America Online. Accessed 03/03/2013.